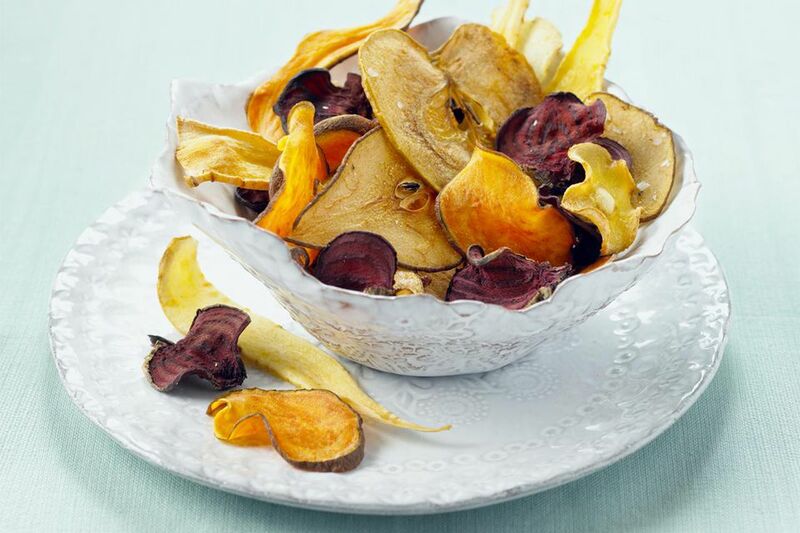 One of the ways raw food enthusiasts keep their diets varied and interesting is to use a food dehydrator to add crisp textures to foods such as veggie chips and seed crackers. The popularity of raw food diets (also called "living foods") has lasted for enough years now to have outlived fad status. People are drawn to a raw food diet for a number of reasons including the purported health benefits, increased vitality, and weight loss. The basic idea is that cooking destroys not only many of the vitamins in food but also enzymes that may be important to our health. Food that reaches 118 F is no longer considered raw because, apparently, it is at temperatures above that that the food's nutrition is diminished. Because of this, dehydrating temperatures for food that still qualify as raw once dried are typically between 105 F/41 C and 115 F/46 C. That is significantly lower than the 135 F/57 C to 150 F/66 C usually recommended for drying fruits and vegetables. What this means is that if you want to dry foods but still keep their raw status, you'll need to allow for up to 1/3 longer drying time than the usual dehydration recipe will specify. Although I am not a strict raw foodie myself, I do like my food to be both delicious and healthy, so I thought I'd try a couple of raw food dehydrator recipes. I was impressed. These simple recipes do produce tasty results, and I like the idea that the lower drying temperature means more nutritional value in the final product. Foods thoroughly dried at lower temperatures will keep just as long as those dried at the usual slightly higher temperatures. Keep in mind that vitamin content does gradually decline in dried foods stored longer than 9 months. Also keep in mind that if you are doing a strictly raw food diet, the usual method of reconstituting dried foods won't work for you. Typically, boiling water is poured over the food, which is then left to soak in the hot water for up to 30 minutes. Instead, raw food practitioners will use cold water or barely warm water and longer soaking times. Note: If you are not on a strict raw food diet and you're in a hurry, you might want to try these oven-baked kale chips.